Platon Mavromoustakos is Professor at the Department of Theatre Studies, National and Kapodistrian University of Athens. 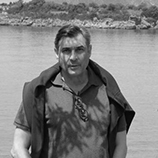 He has collaborated with many theatre organizations in Athens, directed research projects and published on twentieth century theatre and stage directing, ancient drama in modern times, modern Greek theatre, reception of Italian Opera and French theatre. He is a founding member of the European Network of Research and Documentation of Performances of Ancient Greek Drama and member of its coordination committee. His books include Theatre in Greece 1940-2000. A Survey (2005), Outlines for Readings (2006), essays on European and Modern Greek authors, and In Lieu of Critique (2006), a collection of critiques. Among other works, he is the editor of Yannis Sideris, History of Modern Greek Theatre 1794-1944, Karolos Koun Performances (2008), Theatre of Piraeus (2013), co-editor in French (with V. Broze, L. Couloubaritsis et. al.) of Le Mythe d’Hélène (2005) and (with S. Felopoulou) of Relations France-Grèce: Le théâtre des années 1960 à nos jours (2017).